Mesut Ozil appears to have been left out of Unai Emery's Arsenal squad ahead of the Gunners' Premier League clash with Liverpool on Saturday. Emery's side arrived on Merseyside late on Friday, but Ozil was not seen amongst the travelling group. Aaron Ramsey, Lucas Torreira and co. were all pictured getting off the Gunners' coach in Liverpool, but their German teammate was conspicuously absent. ​Ozil was named amongst the provisional squad, the ​Mail report that he has seemingly dropped out ahead of what is a crunch game in Arsenal's battle to finish in the top four. The 30-year-old was hauled off at half time in ​Arsenal's 1-1 draw with Brighton on Boxing Day, amid increasing speculation that the German's time at the Emirates is coming to an end. Despite only signing a bumper £350k-a-week contract last January, the former ​Real Madrid star has dramatically fallen out of favour under new manager Emery, and has been linked with a move away as early as next month. Heading into Saturday evening's ​Premier League clash, the Gunners find themselves 13 points behind their Anfield counterparts who find themselves top at the halfway stage of the season. 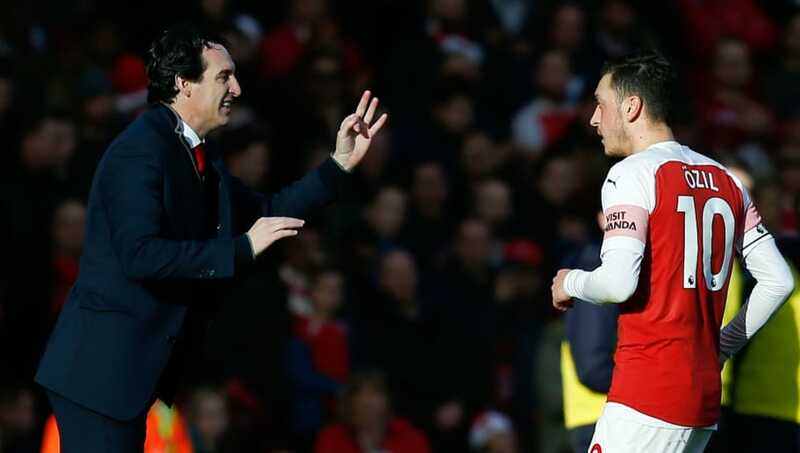 ​Liverpool's form and unbeaten start has drawn praise from Emery, who has tipped Jurgen Klopp's side to emulate the Arsenal Invincibles by remaining undefeated for the entire season. Arsenal saying nothing over speculation Mesut Ozil has been left out of squad for Liverpool trip. Club do not announce squad for domestic league games. He trained with first-team today and was not included on pre-match medical update. He said: "At the moment they are doing and they can do it. They are doing it at the moment. The progression is clear: they were out of the Champions League and they are an example for us at Arsenal now. We need to be demanding of ourselves but we need time and patience is very important."